Hardiness and self-reliance are the outstanding features of this ancient breed. Hill flocks of this breed, in normal conditions, require no supplementary feeding, they thrive on the short rough grasses and herbage of the unploughable uplands. They are an ideal breed for the smallholder as well as being used in their natural environment on the hill. They are a good breed for children to work with as they are shown on halters and the lambs are easy to handle. 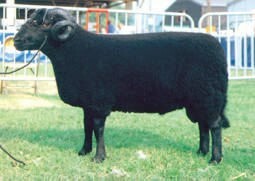 They cross well with terminal breeds to produce good quality tasty meat both as a crossbred and as a purebred. Average mature ewe weighs 45kg, rams 60-65kg. I.D.G.R. was established in 1980 for the purpose of providing a low cost registration and record-keeping service for owners of ALL breeds of goats and sheep. With four herdbooks for Purebreds, Americans, Grades, and Experimentals in every breed, there is a â€˜homeâ€™ in IDGR for every goat and sheep. In October 2014 we took on the name "International Dairy Goat Registry-International Fiber Breed Registry" to allow our name to better reflect our mission.